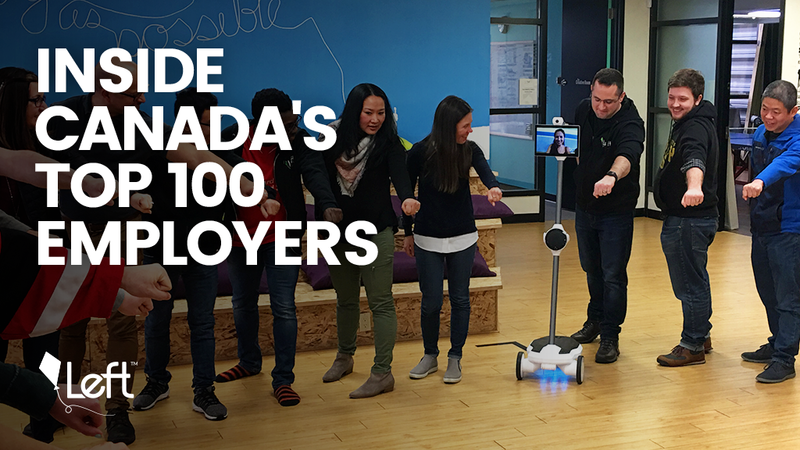 Earlier this year, Left was honoured to have been named on the elite list of Canada’s Top 100 Employers. The award recognizes companies that invest in their employees’ personal growth by offering unique initiatives, continuous learning, and development opportunities. With that statement in mind, we want to share some of our ‘Lefty magic’ by giving a behind the scenes look into what makes Left one of Canada’s Top Employers. To start our #InsideCanadasTop100 tour, we bring you to the boardroom which reflects that 1/3 of our people are in Maple Ridge and the other 2/3 of our team are in Bangladesh. We use this room to conduct team calls to bring our global Lefties together. The other special thing about this room is that it has our B-Corp certificate. We became a certified B-Corp in 2017, which means we’re committed to use business as a force for good. It was a tough milestone to achieve, and we are very proud to have earned it. As a technology company, we practice agile methodology and use sprints to organize our workflow. We have our goals visually displayed to encourage cross-department transparency within the company. Dhaka is the capital of Bangladesh where over 18M people live and where Left has one of its two Bangladesh-based offices. Like many evolving cities in emerging markets it is growing rapidly. Each year, almost 1M people are added. When you have that kind of growth, the infrastructure simply can’t cope. Healthcare, roads, connectivity – they’re all being strained. A large part of what we’re building with the RightMesh project is about finding solutions for those in emerging markets. The Dhaka room reminds us of this, and the people we’re trying to help. When we set up Left we looked to people we admired, and one of those is Walt Disney because of how he set up his business. In 1957, he had the foresight to imagine what Disney could be today. With Left, we have tried to do the same by building a company with a strong vision of lasting value. Everyday our team meets at 10:10 am to share news, updates, wins, and most importantly, the numbers. We practice open book accounting, because we believe if everyone has a chance to hear the numbers, they have an opportunity to influence them. Through our award-winning ‘Dream Program’, we help our Lefties identify their personal dreams, and we support each other collectively to achieve them. Whether an individual’s dream is to buy a home, be a digital nomad, achieve Permanent Residency in Canada, or something as simple as have the time to teach their kids to cook, we pool resources or tickets, conduct training, or find other creative ways to support each other. We believe that whatever the dreams, it is our obligation to help our Lefties achieve them because they are helping us achieve our corporate ones. Our library acts as a multipurpose room. It serves as not only a quiet place for our Lefties to work or read but is also a spot for our Lefties’ children to spend a few hours when they’re off school. We find that if we focus on our Lefties’ strengths, rather than their weaknesses, they’re more passionate about the work they’re doing. That is why we use ‘Strength Finder 2.0’, an online resource that identifies ‘stand out’ traits. We display the results on our wall to show our team the best ways to work with each other based on our strengths. A few years ago, we realized we could spend a few hundred dollars on an okay boardroom table or we could spend the same money on a really, really nice table tennis table… guess what we chose? One of our favourite unique initiatives, the ‘Legendary Lefty program’ was put in place as a way for Lefties to nominate their peers when they see them demonstrating our core values. Every month at each of our offices, one ‘Legendary Lefty’ is chosen from our wall of peer nominations and recognized in front of the team! The very essence of Left is reflected in our 10 core values which we’ve had since the company’s founding. We keep our values displayed on our kitchen wall to keep them top of mind and be the best we can be. If you have any questions about our programs or initiatives, or if you would like to come see our office for a culture tour, please reach out to amber@left.io!